Ambassadors from all over the Federation have assembled on Deep Space NineTM for a conference that will determine the future of the planet Bajor. Keeping dozens of ambassadors happy is hard enough, but soon terrorists begin a bombing campaign on the station, and Commander Sisko's job becomes nearly impossible. Distracted by all of this, he's in no position to deal well with the arrival of a belligerent Cardassian commander demanding the return of Deep Space Nine to the Cardassian empire, but he must rise to the occasion if his station and Bajor are to emerge from the crisis intact. Commander Benjamin Sisko finished fastening his dress uniform and pulled at the tight high collar in irritation. A quick glance into his mirror revealed his brows drawn together into a dark frown, an expression which had frequently given pause to both his enemies and his Starfleet subordinates. Dammit, he thought, I didn't sign up for Starfleet to end up playing ambassador to half the sentient races in the galaxy! Sisko, did not, in truth, much resemble a diplomat at that moment. The face in the mirror belonged to a man who preferred to take the direct route straight to the heart of a problem, not tiptoe around it with half-ties and evasions and eloquent phrases that sounded good but committed the speaker to absolutely nothing. And especially not wearing resplendent, uncomfortable dress uniforms. 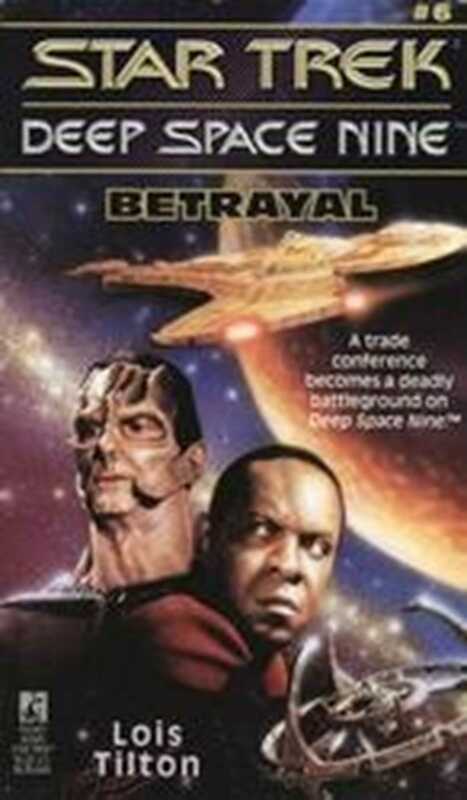 But the fact remained: he was the commanding officer of the former Cardassian space station now called Deep Space Nine, and thus the ranking representative of the United Federation of Planets in Bajoran space, which positions entailed a number of unwelcome duties and responsibilities, diplomacy among them. And Benjamin Sisko, was not a man to shrink from any duty. Still scowling, he searched in his drawer for a pair of white gloves. "Pad! That farking Cardassian replicator's fritzing up again! It -- "
"Jake! Watch your language!" Sisko snapped automatically as his teenaged son came into the bedroom. The boy picked those words up from that Ferengi kid, the father thought, a bad influence if there ever was one. And Nog had doubtless picked them up from the Cardassians, when the station was Cardassian, and the personnel used to hang around in his uncle Quark's casino. But it was also true that he was the only other boy Jake's age on DS-Nine. "I thought you said we could take the runabout out today. You promised you'd let me take the conn!" Sisko's irritation immediately changed to guilt as he saw the stricken look on Jake's face, staring at the dress uniform. It was true, he'd promised his son an excursion away from the station. He hated to break his word, but he had no real choice -- not this time, at least. "I'm sorry. But an emergency's come up. I have to greet the Kovassii delegation when they dock. There's no way out of it." Jake's scowl made him look even more like his father at that moment. "You always say that! There's always an emergency somewhere in this place!" Sisko sighed wearily. "Jake, it's my job. You know that. These trade negotiations are important. Don't you think I'd rather be teaching you to pilot the runabout than standing around in this...uniform shaking hands with a bunch of self-important diplomats? But we don't always get to do what we'd like in this galaxy-or any other I know about." "That's for sure!" Jake muttered. "Not around here, anyway." "Well, why do you have to be the one to meet this stupid delegation? Why can't somebody else do it? What about Major Kira?" "Because I'm the station commander, that's why. Because that makes me the official representative of the Federation in this sector. The Kovassii a are very touchy about protocol and security. And they re particularly nervous after that incident at the docking pylon." The commander's frown deepened. So much for security and secrecy in his command. It was impossible to keep anything quiet around this station. "I'd prefer it if you didn't mention the fact in public, but, yes, it was a bomb." Sisko sighed. It took a real fanatic to set off an explosive device on a space station full of civilians. It had gone off on docking pylon two, damaging the main airlock and forcing him to shut down the pylon just when the station was expecting an unprecedented number of ships to arrive for the trade negotiations. At least no one had gotten hurt, but it had taken every ounce of persuasive diplomacy Sisko possessed to talk the Kovassii delegation out of returning directly home to make an official report that Deep Space Nine was swarming with fanatical maniacs and terrorists. He had personally promised, as station commander, to guarantee their safety when they docked. Thus the dress uniform, required by the delicate Kovassii sense of protocol and ritual. Thus his broken promise to his son. "So why are all these delegations meeting here, anyway?" Jake asked, the sulky tone still in his voice. "If they want to negotiate with the Bajorans, why don't they just go down to the planet and have their meetings there?" Sisko looked at him. "Is that a real question or just another complaint?" A pause. "A real question, I guess." "All right." Sisko touched his comm badge to activate it. "Sisko to Ops. Can you give me an ETA on the Kovassii ship?" "They're cleared for pylon three, Commander. They should be docking in forty-five minutes. Their pilot seems to be taking, um, all due precautions in making his approach." "You can inform the security detail that I'll be at the airlock when they come in, then. Sisko out." He turned back to Jake. "All right, I have a few minutes. Look, the Cardassian occupation hurt the Bajorans in a lot of different ways. I don't mean just deaths and physical damage to their world, like the damage you can see here on the station. The Cardassians were ruthless. They didn't care if they left a single soul living on Bajor. At least here on DS-Nine they had to leave basic life-support systems intact. "It was a brutal occupation. And if you learn one thing, Jake, learn this: Brutality only breeds more used to be a peaceful people. When the Cardassians first invaded, they had no idea how to fight back. But the occupation taught them to fight repression with terrorism. Three entire generations were bought up that way, living in exile and in forced-labor camps." "But I don't get it," Jake protested. "The Cardassians are gone now. The Bajorans won! They got their world back. So why are they still fighting and blowing things up?" "That's what I'm trying to explain. Strange things can happen to people when they've spent their whollives fighting for a cause. Think about it: Now that you've won, who gets to pick up the pieces? Who gets to put them back together again? Who gets which share of what little there is left? "They have peace now, but they can't quite remember what peace used to be like. Some of them have forgotten any other way of resolving a dispute. Violence can turn into a way of life. And, besides, only a minority of the Bajorans are involved in all this factional infighting. But the entire world suffers from their reputation. Too many people think all Bajorans are terrorists." "So I guess the Kovassii wouldn't want Major Kira to meet them at the airlock, huh?" Sisko tried to suppress his grin, but he knew that Jake's remark was only the truth. Major Kira Nerys, his first officer, was a Bajoran, not a Federation officer. Deep Space Nine was officially a Bajoran station, although it was under Federation administration, and the joint command reflected that complicated fact. It was also true that Kira, before she had put on the uniform of an officer in the service of the provisional Bajoran government, had been an active member of the Shakaar resistance group, which was for all intents and purposes a terrorist organization dedicated to driving out the Cardassian occupiers by any means possible. No, the touchy Kovassii ambassadors certainly would not be pleased to discover that Major Kira was personally escorting them onto the station. "The point is, Jake, this station is the one place that belongs to all the Bajorans, not just some group or order or faction. When the delegates come here, they're meeting at the nearest thing to a neutral zone in all Bajoran space. And what keeps it that way is the presence of the Federation. Our presence. If Starfleet were to abandon Deep Space Nine, the Bajorans might blow it apart fighting over which faction would assume control." "Or the Cardassians would move in and take it over to get hold of the wormhole to the Gamma Quadrant," Jake added knowledgeably. "Or the Cardassians would take it over, right. And what keeps them from doing that now? You know the station doesn't have the weapons to defend itself against Cardassian warship. But because we're here, the entire Federation is here, behind us. "And that," he concluded, "is why I have to wear this damnable uniform and go to that airlock to bow and shake hands with the Kovassii delegation. Because I'm the official Federation representative and that's my job." Sisko stared at the gloves. "Oh, right." As he started to pull them onto his bands he said, "It's a protocolthing with the Kovassii. They think displaying bare hands is offensive, for some reason." Flexing his fingers, he went out into the other room, about to leave, when he noticed the sputtering lights of the Cardassian-built food replicator. "What's the matter with that thing now?" he muttered, coming closer and hitting the Reset control. "No, wait! That's what I was going to tell you, the replicator's -- "
But it was too late. A foaming pinkish blob materialized on the tray, spattering Sisko's gleaming white gloves.
" -- fritzed again," Jake concluded unnecessarily. Sisko took a deep breath but controlled his language in the presence of his son. Just then his communicator beeped. "Commander? The Kovassii ship is expected to dock in ten minutes." Sisko exhaled forcefully. "Be right there," he informed Ops. Then, to Jake, "Clean up that mess, would you? And I don't want you hanging around the Promenade with Nog, either. You have your n-space topography problems to finish, if I'm not mistaken." "Yes, sir," said Jake unhappily as his father left their quarters. Left alone, he brooded on his injustices. The replicator was broken again, so there wasn't anything to eat. This stupid station was full of Cardassian junk, and none of it ever worked right. And those topography problems were hard. He'd been going to ask Dad to help him with them, but Dad was never around long enough. He was, always in a hurry. There was always some stupid emergency. And now no trip in the runabout. It wasn't fair. I should have known I wouldn't get to go, he thought. Nothing good ever happens around this place. But at least on the Promenade, there was usually some excitement. And kiosks where he could get something to eat. And if he was lucky, if he hurried, he might even run into Nog.